Victoria Dixon. 32 years old. I am married and have two children, Milly 5 and Robbie who is almost two! We live in the beautiful Islands of Orkney. I have turned my hand to a variety of different positions, from bar work to being an Apprentice Jeweller. My main job was in Administration but having studied a Degree in Art & Design I felt that this really quashed my creative juices! I had been a Mum for 15 months before I launched my business – I hadn’t been working for a while prior to having my daughter as I was advised not to work through my pregnancy having lost our baby boy 8 months into my previous pregnancy so I found making the transition from working full time/being pregnant to having a child and working for myself went quite smoothly! Initially, as a hobby, I had played around with image-editing software on my computer, and had submitted a few pictures to art galleries – these had sold well. 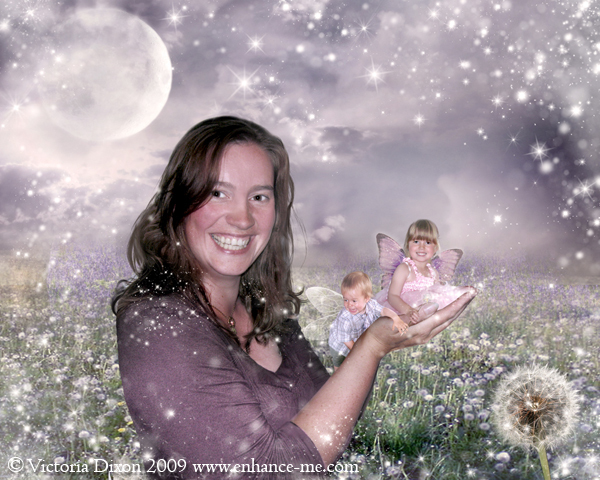 I had then been experimenting with Photoshop and had created a portrait of my daughter as a fairy. Later I did a few free portrait enhancements for friends, who had requested that photographs of their children be transformed into fairies. These friends had such a positive reaction at the final result that I decided to dip my toe in the water and put the service online. Very little financial outlay was required – I had everything I needed! I didn’t even need to pay for a website – I was able to create and build my own website, with the assistance of a very helpful and patient husband who had worked in web design. I spent some time networking and researching similar sites online though back then there were very few so I felt I had a huge market. I investigated pricing options, what exactly to offer – prints? Files? etc…. I decided rather than trying to compete with the large low price online digital printing companies I would offer the final portrait files digitally and keep it simple to begin with. I have found that I haven’t really needed to outlay much money on my business, any outlay I have made has been more recently for stock photos and various networking & advertising tools and has come directly from my own profits so it’s currently funding itself! I market it by networking online and via word of mouth. I have also had a number of reviews and articles written about the business which has helped. I find that networking online works well – in fact I have had more success that way than I have spending money on expensive adverts in newspapers and magazines. My business is now into its fourth year and it has been mentioned in a large number of popular blogs – had many reviews and been in Prima baby magazine as well as some regional Newspapers. Myself and my business are also being featured in two books this year. I work with a number of photographers worldwide and a number of online retailers selling my portraits. I am finding that I have many returning customers – Getting online is a great investment for any business – it certainly has been for my business. I have taken in thousands of orders from the UK to Alaska, China, to the USA! Basically it has enabled me to market my services worldwide. Being able to take such a simple idea and set it in motion….combining all my skills and developing something that was previously a hobby into a successful business. Also that it involved very little, in fact almost no financial outlay has been very positive! My most challenging period of time is always the approach to Christmas. In the two weeks leading up to the festive season I receive in the region of 200 orders! I always panic slightly at the prospect of trying to juggle so much work with caring for my children, but with the help of my husband, parents-in-law and many late nights, I manage. My order intake increases every year in the approach to Christmas but I am gradually finding ways of coping with it. I also found it a big challenge when my son Robbie was born. I was in hospital for four weeks and as I had to leave with no warning I had to try to contact customers through my husband and a hospital internet hub, which was really fiddly and frustrating! When you are a Mum running a business these are things that you almost learn to expect but simply cannot prepare for. I find lack of time a real frustration too as there are so many things I have in the pipeline but really have to prioritise. Finding a balance can be tricky. I am lucky in that Robbie is still of an age where he naps and his naptime coincides with when Milly is at nursery so this gives me at least 2hrs every weekday morning during term time. My husband is very patient and allows me to check emails and do work related things for a time when he returns home from work in the evenings. I then devote most nights to working, some until almost midnight. Learning how to juggle everything can be a steep curve! I think that being able to prioritise is so important – I have lots of ‘To-Do’ lists and have to deal with the most important first! That usually always involves my children and dealing with customer’s requests – then everything else eventually falls into place! Mind you I would be the first to admit I am a total twitter addict & that’s hardly a priority!! It’s important you love what you do – otherwise finding motivation for it will be difficult. In this area it is so important to be able to find new ideas, I am constantly trying to develop new themes and products – it keeps the business moving and not only brings in new customers but keeps the attention of your current customers!